The Gentleman Crafter: All Geared Up Baseball Cap Project! On Tuesday night I was in the studio trying to come up with a Steampunkish looking ball cap to wear. I found a cloth ball cap at the craft store, purchased a few sheets of fun foam and some Beacon Fabri-tac Permanent Adhesive and I was off! Cut multiple shapes from the foam and apply Fabri-tac to the gear shapes and adhere them to the cap. 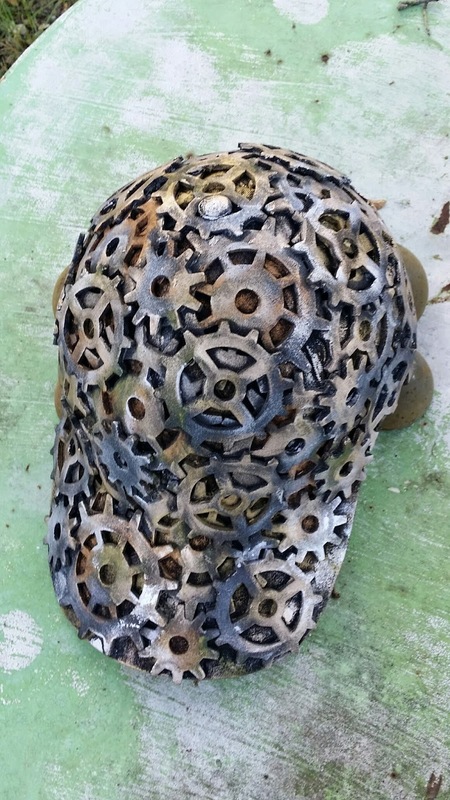 Completely cover the hat first with a layer of gears. 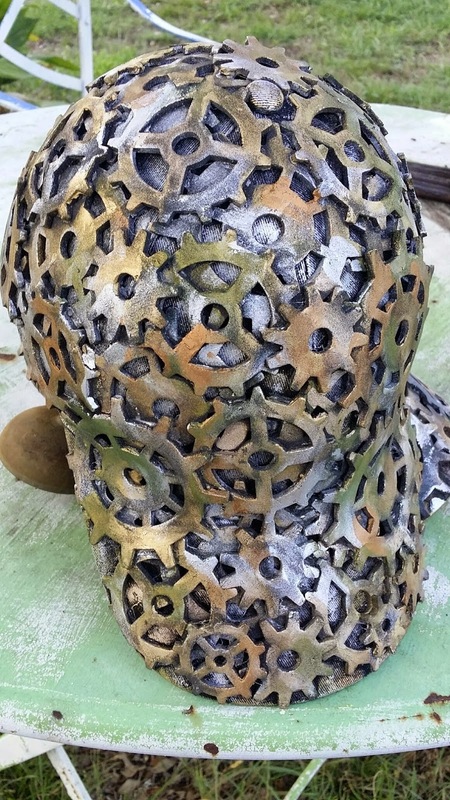 overlap the gears with smaller pieces filling in any blank spots. Once the gears have had a chance to set...go over the gears with assorted metal rubs. I used Guilders Paste in Antique Gold, African Bronze, German Silver and Viva Decor Inka Gold's Silver. Last, I used an old paint brush to fill in the hard to reach smaller areas. Done... This project was inexpensive to make. The cap was purchased from Hobby Lobby for $2.99, the Fun Foam was $1.49 a sheet and the Fabri-tac was $10.99...I had the metallic pastes. Jim, I watched the recording last night. You are a genius, love it. Sorry I missed your Ustream Jim. Your cap is amazing! 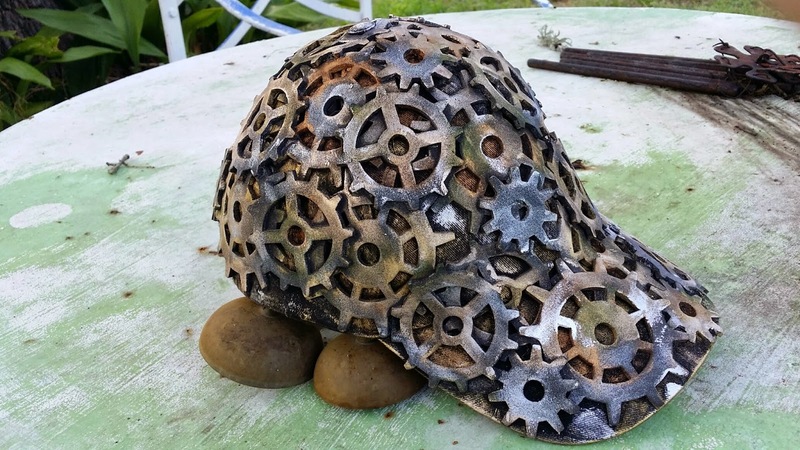 Brilliant Steampunk themed cap! Also very smart to use the beeswax on your dies for easy release. Thank you for being uber Creative! This is kinda where I was heading with my dress form...but I opted for the embossed foil instead as the foiled cogs took too long to glue to the form...Thanks for the foam inspiration! What a great cap! I'd love to see reactions when you wear it! Looks great! What a cool idea. Hmmmmm, thinking pumpkins for fall/Halloween or holly leaves for Christmas. Thanks for sharing your creativity. Wow- that looks like real metal. Thought that cap was going to weigh about 100 pounds and was more a piece of shelf art, but glad to find out its an awesome real hat. Bet you'll get a million comments when you wear it. This is just amazing, love it to bits.